Recently it has been brought to my attention that there is some confusion about my involvement with Pet Partners www.petpartners.org and their existing policies they have in place to be registered with their program. Here are some important points with information straight from the Pet Partners website to help clarify. Pet Partners has the research, professional advisers and long standing experience to support these policies. 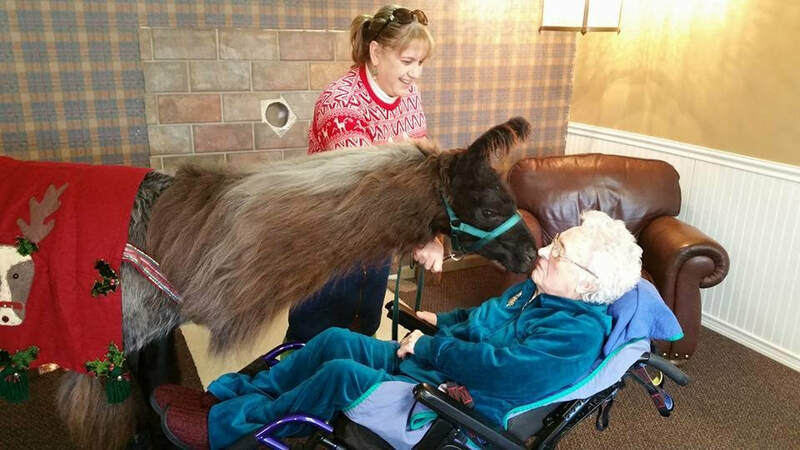 We perform therapy work with the utmost respect and concern for our llamas well being and enjoyment of visiting. Remember that a happy therapy camelid readily interacts with clients and relies on a confident handler who advocates for their wellbeing. The process through which a therapy animal team becomes part of the Pet Partners Therapy Animal Program. This process confirms that the team meets the requirements of our program and is suitable to participate in AAI. There is a distinction between registration and certification. Therapy animal teams are registered, not certified. Certification implies that an independent third party has assessed an individual’s mastery of knowledge and skills. For example, a doctor is certified by a Board of Medicine, not the medical school where they completed their education. At this time, no independent certifying bodies for therapy animals exist. A unique combination of one handler and one animal working together that registers through Pet Partners to participate in volunteer AAI in their community. Because Pet Partners believes in the importance of proactive handling both for animal welfare and client safety reasons, we emphasize the importance of balance between a skilled handler, an appropriate animal, and a positive, communicative relationship between both parties. Our registration process is designed to assess this through a combination of coursework and evaluation. 2.People always ask me, why would I need to go through this process as I am already doing visits on my own? If you have been through and passed the Pet Partners process, you are covered under their insurance. You also have to follow their standards and requirements for visiting (For example not wearing costumes on a visit). Pet Partners will support you in various situations that come up as well. Recently, a question about vaccines administered to my animals was brought up by a facility. Pet Partners staff reached out to the facility and explained their processes and programs. Also verified that I had exceeded the requirements they have in place for a reasonable standard of care. Many facilities are getting tougher on animals visiting, wanting regular records of shots etc. to be able to come in and knowing you are with Pet Partners gives you an easier time getting through. Pet Partners is well known in many facilities around the country. They are considered the experts in the field of Animal Assisted Therapy (AAT). Being part of the most prestigious therapy animal program in the U.S.
Why do they have the requirements they do? Through the years this program has evolved through the input of clinicians in the field of AAT, professionals in academia and more. The evaluation process that is used to evaluate the various species was not randomly chosen and the actual evaluation starts out pretty benign and increases in stress level as you work through it. This is to help sort out the animals that are inappropriate for therapy work. They also require you to be re-evaluated every two years in case the animal has changed with age etc.. Many of the criteria were put in place long before I ever came on board in 2006. While I may answer questions about llamas from time to time and did help rewrite the evaluation process to be more applicable to llamas, I do not write policy or make decisions about who is evaluated, whether you can use a diaper on your llama/alpaca or anything else. Pet Partners has an advisory board that handles much of this. Essentially, I mentor other potential handlers if asked and when appropriate and try to help them navigate this process. I am an advocate for doing AAT with respect to these wonderful animals! Read their animal’s particular body language and recognize when their animal is stressed, anxious, concerned, over stimulated, or fatigued. Drooling or mouth hanging open. Stress lines under the eyes. Threatening to spit or raising the nose up in threat. Kicking, spitting or moving quickly as if to knock someone down. Ears pinned back virtually the whole time. The wearing of diapers for any species on a visit. Note that of all of the camelid teams around the country that are registered with Pet Partners, none of them are wearing diapers on a visit. In addition, there is no standard diaper that can be used on any of the animal species. This policy was in place long before I began being registered with Pet Partners. How could they let some species use diapers and not others? Also, how would you have a standardized diaper that is hygienic and without an odor? Not advocating for your therapy animal partner. One of the biggest things Pet Partners emphasizes is being respectful of your therapy animal. Knowing when they have had enough or are having an off day. Not pushing them beyond generally accepted standards of therapy work. The recognized and researched acceptable time of visiting with a therapy animal is no more than 2 hours. You may not use costumes or other extra things outside a normal halter/lead and therapy vest on a visit. The thought is that people you visit in some populations could get caught in it or cause harm pulling on it. Whatever type of halter/lead you test in (for dogs collar/harness and leash), is the type you must use on visits. When we do visits at Christmas time with tassels and a Christmas blanket on our llamas, we use our farm insurance coverage. It should also be noted we know the people we visit that day and are confident they will not get hurt with these things on the llama. Costumes can be an irritant to your animal and takes away from the purpose of a visit. Therapy camelids are NOT petting zoo animals! HIPAA laws prohibit you from taking pictures or asking specific personal questions while visiting. Confidentiality is VERY important when visiting clients. Also, if you are concentrating on your animal’s safety and all that is going on, you should NOT be taking pictures. Pet Partners has a deep regard and respect for its therapy animal teams and the important role that they play in meeting the needs of the people they interact with. Pet Partners also has high expectations regarding the conduct of their therapy teams. I will visit only with animals that are registered with Pet Partners and with only one animal at a time. I understand that, for safety and liability reasons, visiting may not exceed two hours per team per day. I will abide by all policies, procedures, and precautions of Pet Partners and each facility I visit. If Pet Partners and my facility have two different policies on the same topic, the more conservative of the two will apply. I will always stay with my animal and remain in control of the situation with the lead in my hand. I will never tie animals to people, equipment, or furniture while visiting. For safety reasons, my animal must wear a collar or harness and be on lead, and I will hold the lead at all times, including during breaks. I understand that animals must not be on a raw meat diet at any time during their role as a therapy animal, and that animals from a household where a raw meat diet is fed are precluded from participating in the Therapy Animal Program. When approaching a facility for the first time, I will find out whether any other teams are already visiting there or if there are facility animals present. If there are, I will respect those existing relationships while also making the responsible choices for myself and my animal. I understand that my animal must visit in the same type of equipment that it was evaluated in, and that a change in equipment requires a re-evaluation. At all times, treat all animals, all people, and the environment with respect, dignity, and sensitivity, maintaining the quality of life and experience for all who are involved. Demonstrate commitment, responsibility, and honesty in all phases of your activities. Comply with all local, state, and federal laws and Pet Partners policies that govern AAI. In summation, we highly encourage you to check out Pet Partners program if you are interested in therapy work with animals. Their approach is the most recognized and respected in the field of AAT. We are happy to answer any questions you may have about working with llamas and alpacas for therapy work. We also have a miniature horse we do this work with.